Awards season is here, and with it, the chance to watch our favorite actors and directors be recognized for their work on the year’s best in film and television. While the entertainment industry places a unique emphasis on awards (when’s the last time you tuned in for another industry’s red carpet? ), there might be something to its approach. Actors and directors are asked to go above and beyond, but they’re motivated by big payoffs and public recognition. They know that their contributions won’t be overlooked; when they go the extra mile, they get the eyes and ears of millions. Now let’s think about the world of HR. Recruiters know that to do their job well, they sometimes need to ask favors of others, including requests for employee referrals. Forty-three percent of companies said their best candidates come from employee referrals and the majority of employers find that referred employees outperform other employees on most aspects of company fit. Employee referrals make for highly-qualified candidates, and recruiters need these candidates to support their hiring success and increase retention. But employees have their own responsibilities to manage. Checking available postings, and relaying to friends and family, likely isn’t top of mind. Employees want to know that if they make a referral, their efforts will be appreciated. That’s why it’s important to establish a formal, incentivized employee referral program that actually pays employees for the successful referrals they make. This means the program has the support of your company’s leadership and includes defined rules for how and how much referring employees get rewarded. There are also finer points to consider. Will you pay more if an employee refers someone to fill an executive-level position? When can employees expect to receive their incentive? Clearly communicate the answers to these questions and others when launching or re-vamping your employee referral program. Employees will be more likely to participate in a program they have confidence in. Every position you’re asked to fill could benefit from referred candidates. But reaching out to employees to ask for referrals each time a position opens up isn’t a long-term strategy for success. It’s more likely a way to become white noise in your co-workers’ inboxes. So think about how recruiting technology can lend a hand to help automate the process of relaying job opportunities to your employees’ networks (and bypass extra legwork for both you and your fellow employees). For example, iCIMS’ Social Distribution makes it possible to automatically post jobs to employees’ social networks, at a frequency of their choosing. After initial sign up they’re done; your job openings automatically post to their feeds. If someone in their LinkedIn network clicks on the post and fills out an application, the system automatically tracks the referral, so appropriate credit is given. It’s streamlining like this that makes participation a no-brainer for employees. It isn’t always about the money. Employees may also be motivated by public praise and appreciation. Who among us wouldn’t want recognition for referring a new hire, especially if that person is proving to be a company all-star? Research has found that firms with extremely well-designed programs can reach over 50 percent of all hires from referrals, without any cash incentives. Consider that most TV and film award ceremonies don’t involve cash prizes; they’re occasions for external appreciation and recognition. You can take the same approach with those that successfully refer new hires. 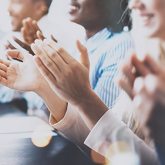 Announce which employees made successful referrals each month, encourage company leadership to extend personal appreciation to referrers, or give your employee referrers recognition at your annual company picnic or holiday event. With the help of your recruiting technology, you can also track which employees generate the most referrals over time, to make it easy to reach out to top performers directly when a particular position needs to be filled. This personal, direct outreach lets the employee know that you see them as a valuable resource, and can encourage them to continue to participate. Interested in learning more about the value of employee referrals, and how to get an employee referral program up and running? Check out another one of our Hiring Insights articles, 5 Powerful Methods to Promote Your Employee Referral Program.